The Oxygen 25 USB MIDI controller delivers next-generation functionality from M-Audio®, the leading innovator in mobile music production technology. The Oxygen 25 features eight assignable knobs, plus dedicated transport and track select buttons. DirectLink mode automatically maps these controls to common DAW functions* including transport, mixer, track pan and plug-in parameters. Built-in factory presets offer support for popular virtual instruments right out of the box—no complicated setup required. Velocity-sensitive keys and a sleek, compact design round out a portable keyboard that’s perfect for laptop production, live DJ performance, triggering samples or composing on the go. No other MIDI controller in this price range has so much functionality while remaining easy to use. 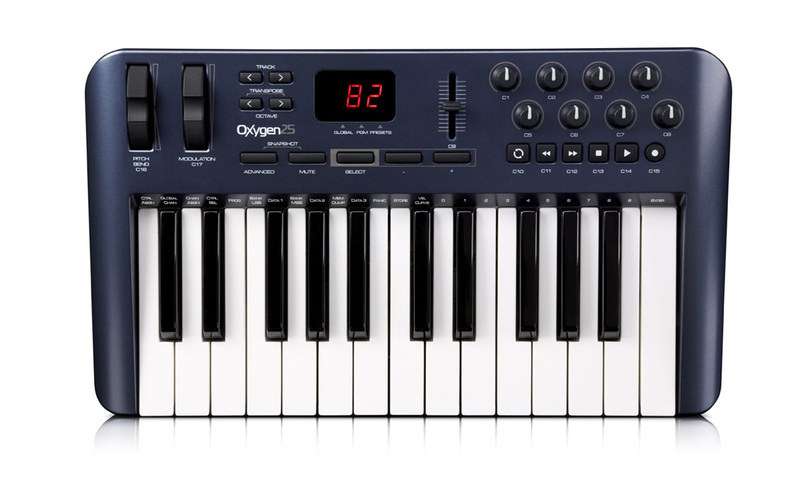 Featuring eight assignable knobs, a programmable slider, dedicated transport controls and track up/down buttons, the Oxygen 25 gives you total control over your session—allowing you to stay engaged in the creative flow of recording and mixing music rather than being interrupted by the constant back and forth between QWERTY keyboard and MIDI controller. DirectLink mode automatically maps Oxygen 25 controls to common DAW parameters*—while factory presets provide instant mapping to popular virtual instruments including Xpand!™2, Hybrid™, Velvet®, Strike®, Oddity, ImpOSCar and MiniMonsta. Use the dedicated Select buttons to quickly switch MIDI channels and presets for deep tactile control over multitimbral software instruments. Interfacing a MIDI controller with your software doesn’t get any easier than this. M-Audio pioneered the category of mobile MIDI keyboard controllers, and we continue to be the best-selling name in the game. 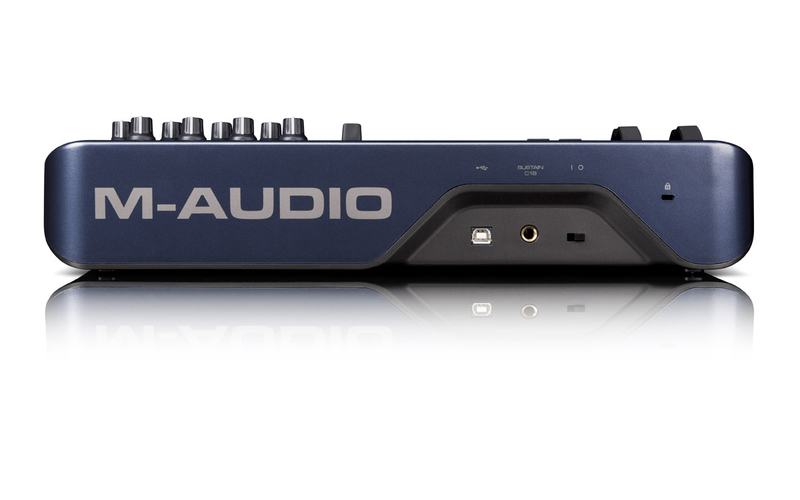 In fact, M-Audio controllers are used by more professional producers and players than any other brand on the market. Thanks to continued innovation over the course of nearly a decade, you’ll find that the Oxygen 25 controller has a solid, reliable build—and puts as much musicality into the keyboard as it does into the complement of other MIDI controls. The Oxygen 25 MIDI controller offers out-of-the-box integration with Pro Tools® software—the industry standard DAW found in professional, project and personal studios around the world. With DirectLink, the Oxygen 25 controls instantly map to key parameters on the Pro Tools Mixer, Edit and Transport windows—as well as the powerful suite of virtual instruments bundled with Pro Tools. Together, Oxygen 25 and Pro Tools software provide streamlined workflow in a formidable system with tons of interface options and industry-standard file compatibility. The Oxygen 25 keyboard packs an amazing amount of control for DAWs and soft synths into an incredibly small footprint. There’s always room for it—even in the most crowded desktops, efficient stage rigs or compact studios. It’s also the perfect complement to your laptop for making music anywhere inspiration strikes—whether relaxing on the couch, writing on a plane or jamming on a tourbus. With the Oxygen 25 MIDI controller, you can carry your entire mobile laptop studio in a shoulder bag.